This suicide resistant Divided Double Open Wardrobe is designed and engineered specifically for critical environments. The BF980 features Dura-PlyTM construction and built-in safety features like rounded edges and SafeJointTM concealed joinery for added strength with exposed fasteners limited to the back of the unit. The vertical center divider makes the unit suitable for sharing by two clients. The finish is a catalyzed vinyl sealer coat plus a catalyzed varnish top coat for wear resistance. The BF980 is composed of 3/4” plywood with natural hardwood veneer and impact resistant PVC edge bonding securely doweled and glued at strategic locations. The 3/4” plywood top surface with rounded solid hardwood edge is supported with a double top for additional durability. Sloped top and recessed shelf depth discourages climbing. The bottom shelf has high- pressure laminate for enhanced wear resistance and cleanability. Sturdy 3/4” plywood back is securely fastened to unit for additional structural integrity. 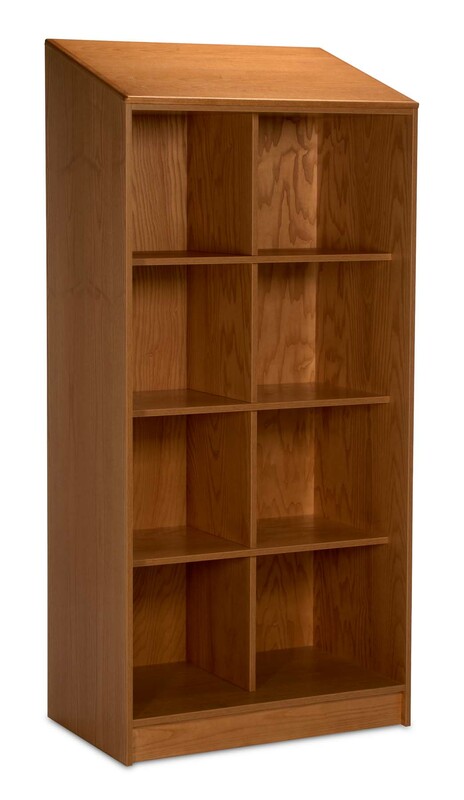 Open shelf design for enhanced safety and security is divided by a vertical center panel to provide four roomy built-in storage compartments on each side. Non-removable, non-mar floor glides are standard. The BF980 is manufactured in the USA, can be bolted down, ships assembled, and comes with a 5 year warranty.